The Hubs and I have been married for 13 1/2 years. In all that glorious wedded bliss we have never had a retreat just for us. Our master bedroom was always the last on the list. We decorated main rooms, we decorated the boys' rooms several times. In two apartments, our first house, and over three years in this house our room has been a hodgepodge of randomness. Well friends, we are all grown up and are working on our very own wedded bliss oasis FINALLY. I have been sharing little bits of our #projectmasterbedroom on Instagram (@larissa_anotherday). We have changed the color and brightened up the trim and doors to a nice white. Our favorite part is our new board and batten wall with shelf. Of course I will show that in more depth soon; I have to do a couple of projects to wrap up before I can show you that. The next favorite part of our Project Master Bedroom is that we now both have nightstands. 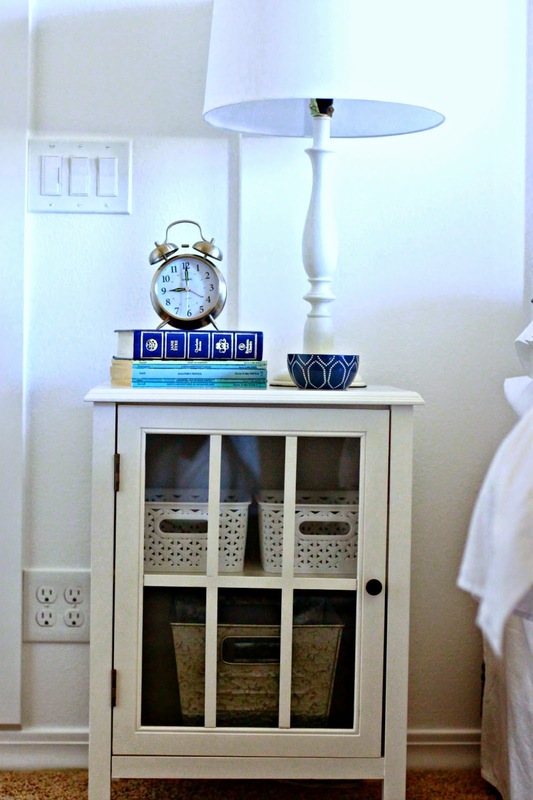 Each nightstand is different yet coordinates with each other and the general style of the room. Both old and new elements. These nightstands happily flank either side of our bed. His and Hers Nightstands, if you will. 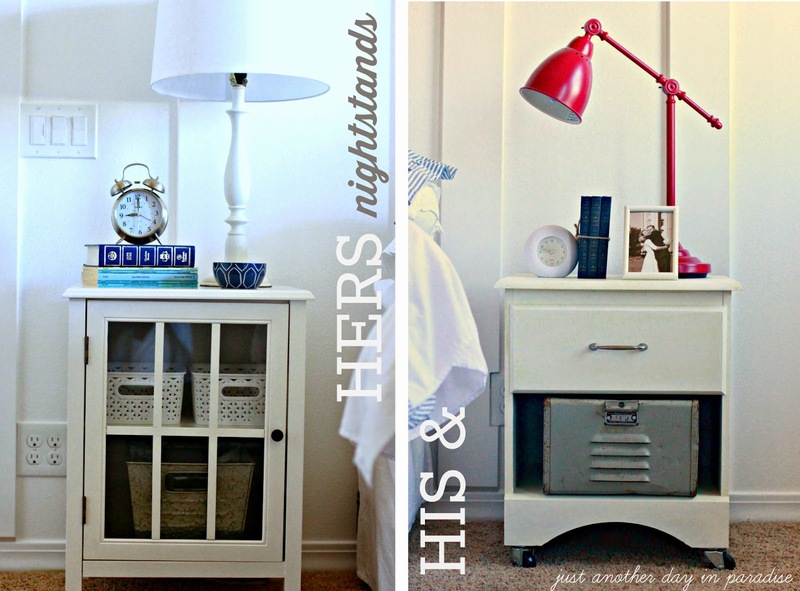 This is a post all about laughing in the face of the idea that nightstand have to be identical to each other. 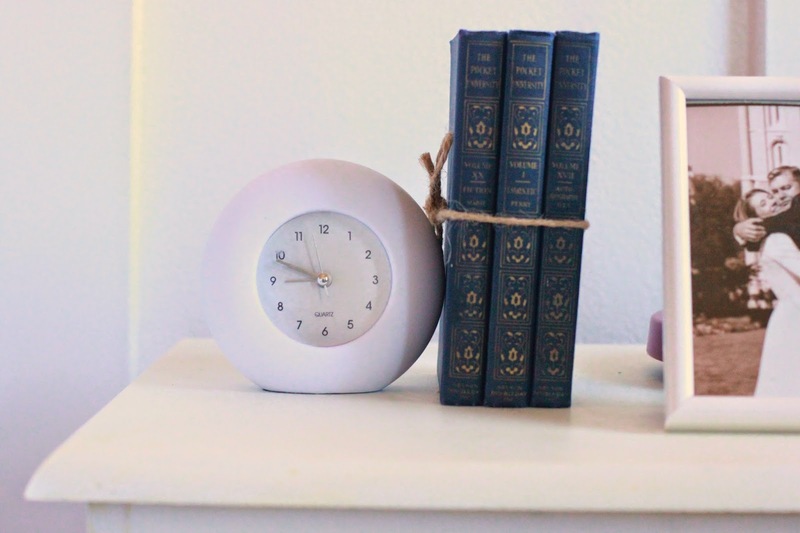 Okay so this post is really about two lovely nightstands that just happen to be on the opposite sides of our beds, hence the His and Hers Nightstands. Let's start with the His Nightstand. This is an old nightstand. We have had this since we first got married. This is a Target nightstand from just before Target got really stylish. They were a little stylish, just not as dreamy and irresistible as they are now. I decided it was finally time to spruce it up. 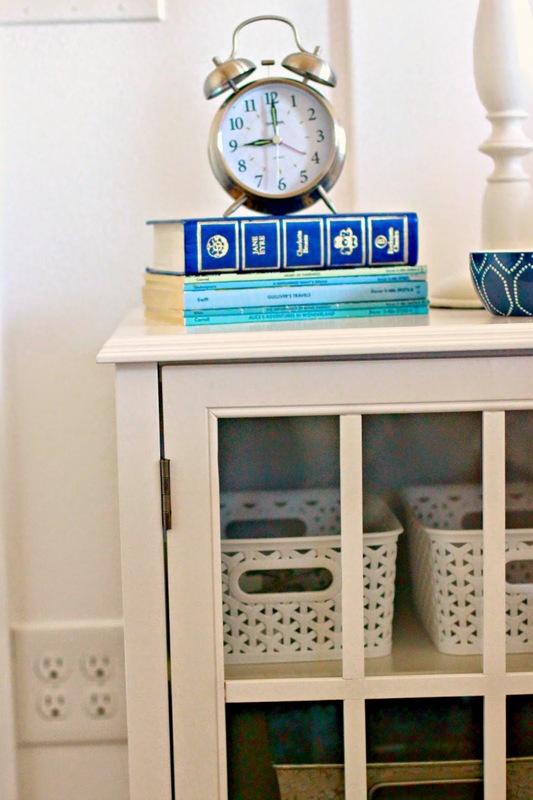 I painted over the laminate honey color with a lovely white chalk paint. Then The Hubs and I attached caster wheels to the bottom to give it not only height, but also a decorative detail. This white little clock was under $3 at The Mart. I paired them with these great vintage readers, in of course my favorite color blue. 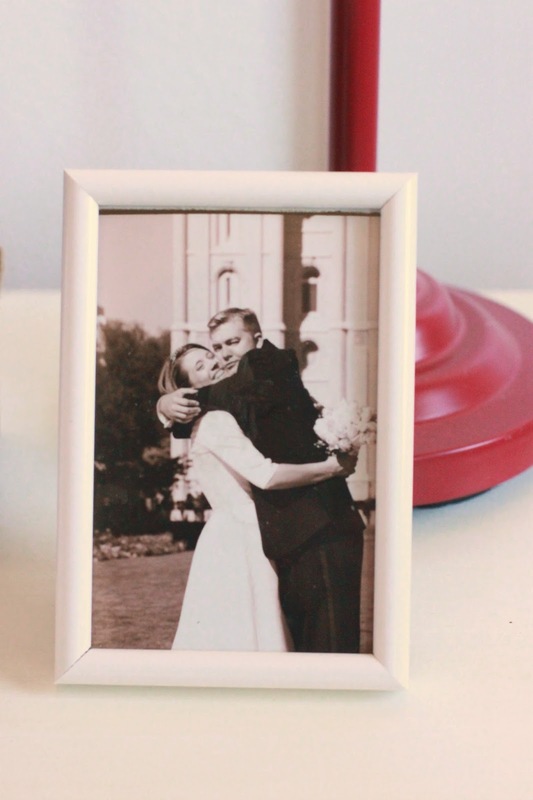 A simple white frame holds a candid wedding shot of The Hubs and I goofing off. 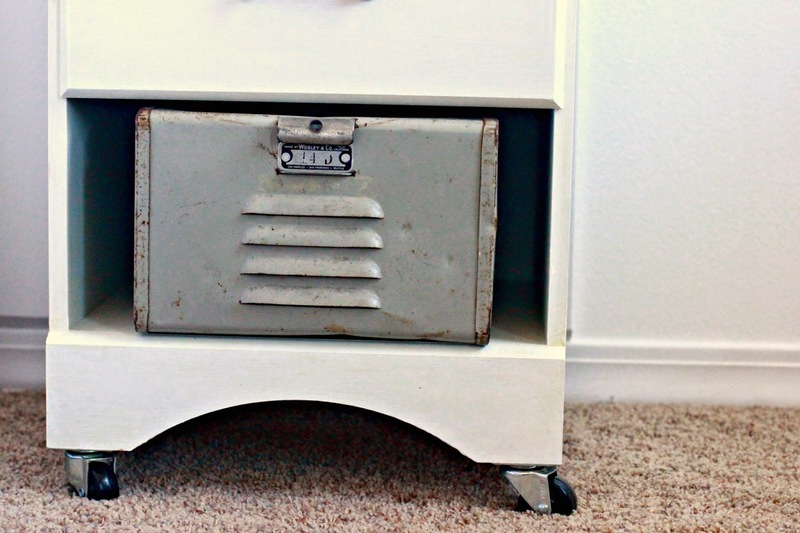 One of my favorite details of the His nightstand is this vintage gym locker basket. LOVE. 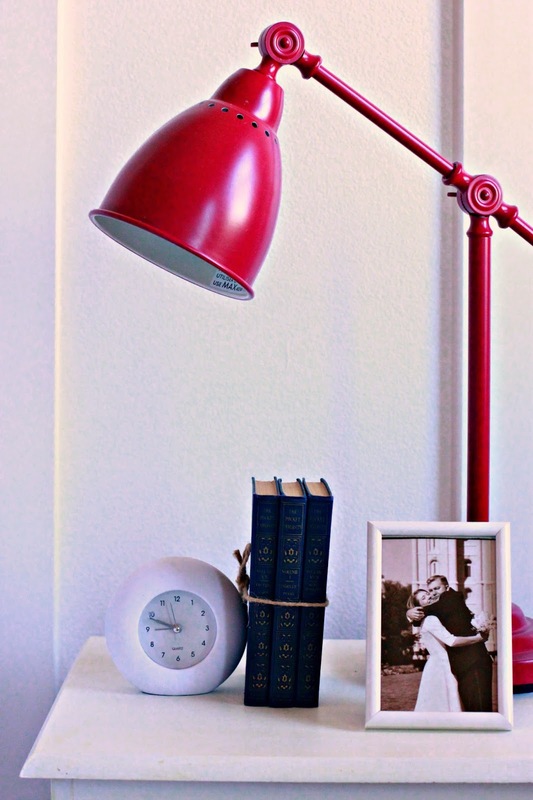 This red lamp from IKEA is a favorite and gives a pop of color. Remind me to thank The Hubs for insisting it stay red (we were originally going to paint it). That was the His nightstand. On to the Hers nightstand. This is a new nightstand, also from Target but circa really stylish and irresistible (obviously). 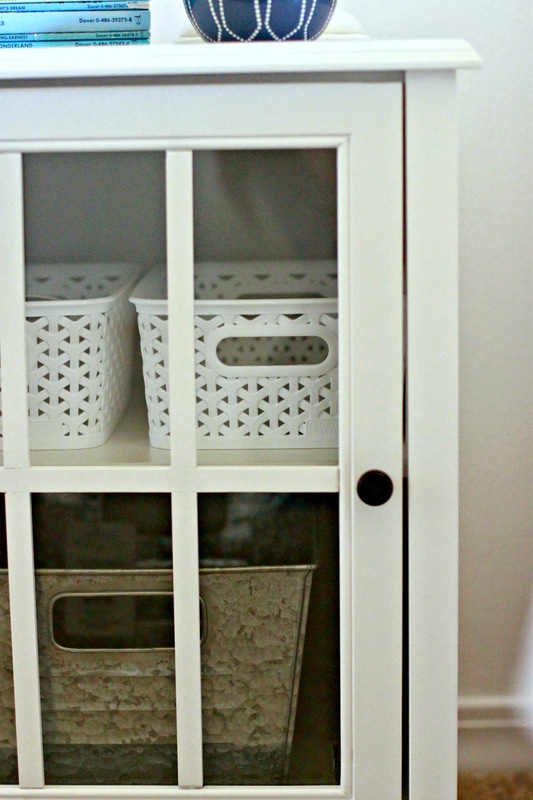 I love the glass door that allow me to show off some cute storage. The white plastic baskets are from Target. The metal bin is from The Mart. 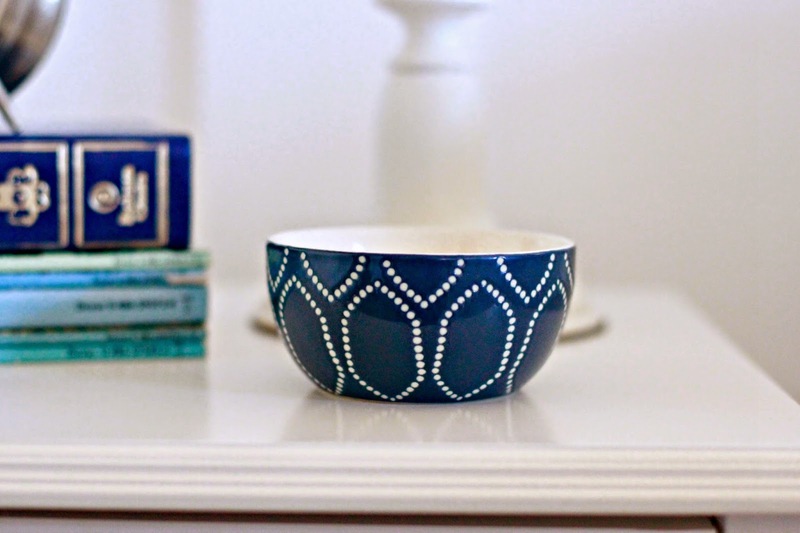 Since I am the lover of blue and white, I accessorized my nightstand with a little more of those colors. I found this glorious bowl in the kitchen section of Target. Little design gems can be found anywhere, so think outside the box. 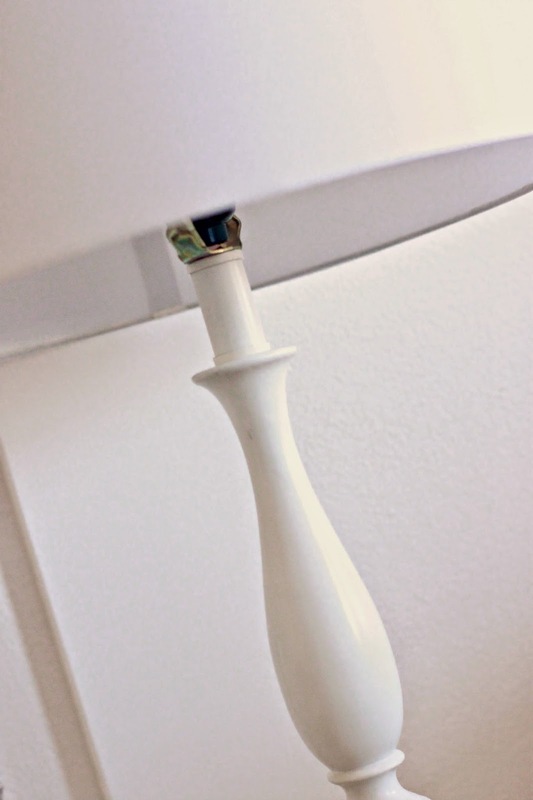 Instead of a colored lamp, I opted for this very traditional white lamp. We have had the lamp for years and year. I simply put a new shade on top. 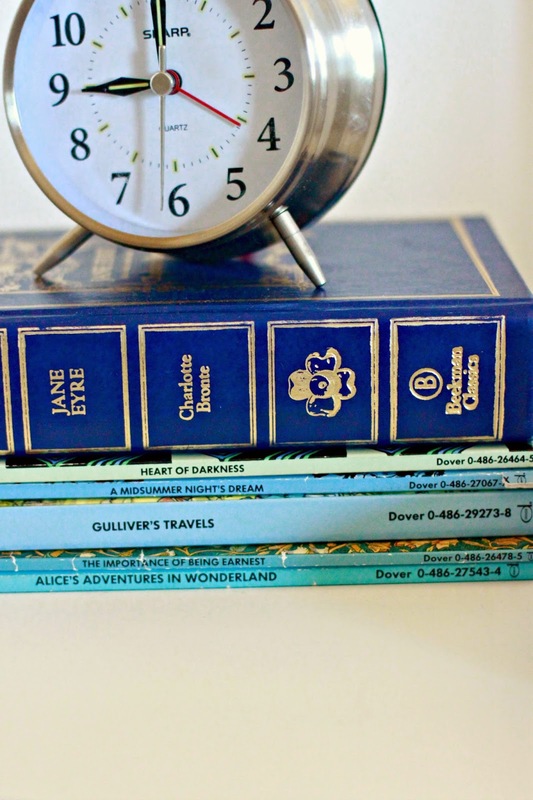 After thrifting from around our house, I used this clock and some amazing blue books. These books have been sitting on our bookshelves since before Oldest was even born. Now they have found a new home on my nightstand. There in all its glory is the Hers nightstand. With these His and Hers Nightstands we are that much closer to completing Project Master Bedroom. I smile every time I see them. Hopefully I can show you the rest of the room soon. 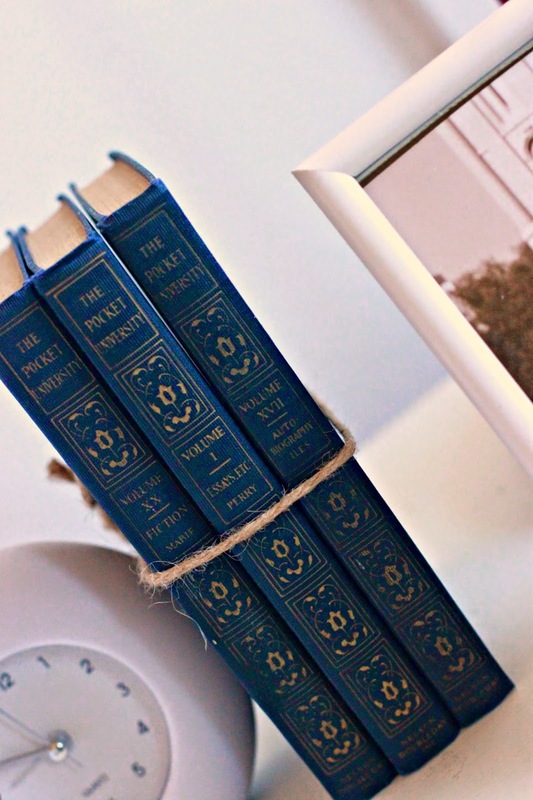 I love your Nightstands and all the great details! 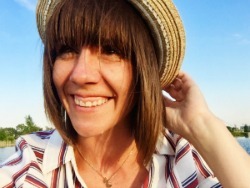 Those are adorable Larissa! I love the idea. I've been searching for matching night stands for FOREVER. Now I can give up on all of that and enjoy this eclectic idea. Awesome! 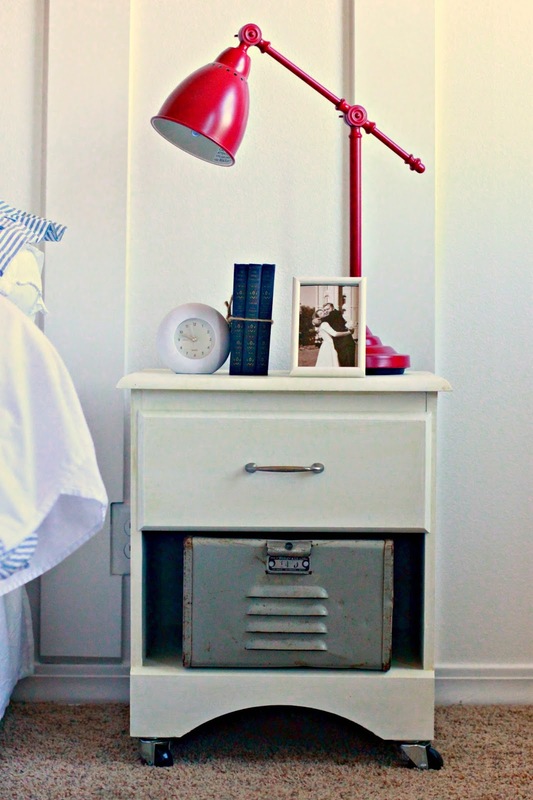 Great Post.This post is really about two lovely Bedroom nightstands that just happen to be on the opposite sides of our beds.